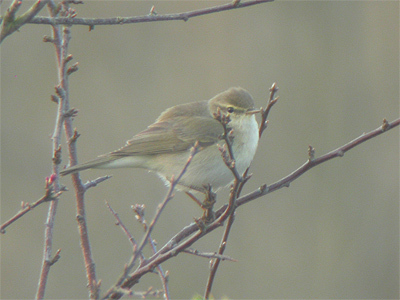 This page shows warbler arrivals into the Eakring area during the Spring of 2002. The final table for the period shows how adverse weather conditions can affect migrants and halt their journey northward. It is interesting to note that there was a 5-6 day period from April 9th, when there were no arrivals at all. This was apparently mirrored at many other sites across the country and was a weather-induced factor, instigated by a low-pressure system over southern Europe. During the peak arrival time towards the end of April, migrant arrivals were again disrupted by more windy weather, again caused by another low-pressure system situated over most of the UK. Both periods are clearly represented in the final arrival table for Spring 2002. The first two tables are introductory, showing the end of the main Chiffchaff arrival period and the first arriving Blackcaps and Willow Warblers. The second table shows the start of the second wave of arrivals onwards. Most daily tables are shown from April 20th and the final Spring table for 2002 is shown at the end of these.